The sport sedan market has officially been put on notice. For far too long, most luxury automakers have been comfortable with the status quo when releasing their latest and greatest sport sedan models. Don’t misunderstand us, manufacturers like BMW have done an admirable job over the year with their offerings, but just doing a “good job” doesn’t mean you are always going to stay on top. Enter the 2019 Alfa Romeo Giulia sport sedan. For starters, it’s got that scintillating Italian style that the legendary automaker has been known for over the past decades. Know what else it has? Genuine sport performance. That’s thanks to some amazing driving dynamics and two incredible engine options. The standard powerplant delivers 280 horsepower, but you also have the option of a 505 horsepower monster engine. Impressive, isn’t it? For an up-close and personal look at all these trims in the 2019 Giulia lineup, consider contacting us online to schedule a test drive at Safford Alfa Romeo of Tysons Corner. You’ll find that we have an incredible selection of new Alfa Romeo models to choose from along with a diverse inventory of pre-owned vehicles. No matter what make or model you are interested in, you can count on our luxury auto dealership serving the Washington, D.C., Arlington, and West Falls Church, VA, areas to provide you with everything you need. That includes top-quality maintenance and service from our comprehensive car care center. Think of us as your one-stop automotive shop for all your needs at Safford Alfa Romeo of Tysons Corner, conveniently located at 8448 Leesburg Pike, Vienna, VA 22182. While the performance and style of the 2019 Giulia is incredible, you’ll also be pleased to know that the inside of the vehicle is equally impressive. You have access to all the latest and greatest technology options with the 2019 Giulia. The large touchscreen system inside the car offers the highly sought-after Apple CarPlay and Android Auto functions. These functions offer an easy way to sync your favorite smartphone apps onto the touchscreen for operation in the 2019 Giulia. Alfa Romeo didn’t forget to include advanced safety tech on the 2019 Giulia either. The available Driver Assistance Dynamic package includes features like Lane Departure Warning, Full Speed Forward Collision Warning Plus, Automatic High Beam Headlamps, and Adaptive Cruise Control. We noted earlier that the 2019 Giulia offers excellent driving dynamics along with impressive horsepower. It all starts with a standard 2.0L turbo-four that delivers 280 horsepower along with 306 lb-ft torque. Want to really supercharge your 2019 Giulia? If so, then you definitely need to check out the Quadrifoglio trim. It comes with a 2.9L twin-turbo V6 and produces 505 horsepower and 443 lb-ft torque. All configurations in the 2019 Giulia come with an eight-speed automatic transmission system. 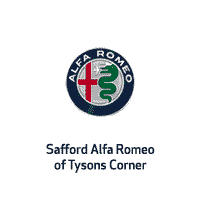 Why Do Business with Safford Alfa Romeo of Tysons Corner? Great selection and incredible purchase and lease specials are just a few of the reasons why more and more Virginians are choosing our dealership for all their automotive shopping needs. We invite you to come visit Safford Alfa Romeo of Tysons Corner to see what a first-class customer experience is all about. *Bluetooth® word mark and logos are registered trademarks owned by Bluetooth SIG, Inc. and any use of such marks by Alfa Romeo is under license. A compatible Bluetooth®-enabled phone must first be paired. Phone performance depends on software, coverage and carrier.